This post is on a parallel but slightly different track from Notorious's post about "Choosing to Change Direction." It's about the three stages of an academic life. Applying for jobs (and applying and applying and applying). Submitting abstracts and papers for conferences. Pouncing on every call for papers. Applying for travel funding and grants. Volunteering to be on committees. Waving your hand high in the air when someone wants you to help with a conference. Hearing yourself say things like "Sure, I can write a draft of the report." Getting rejections and applying all over again. 2. Then, once you have done some of these things, people may start asking you to do them. You get asked to contribute to a collection. A journal editor hears you give a paper at a conference and asks you to submit it. You talk with someone in your field at a conference and put together a panel. Maybe you even get to know enough distinguished people to ask one of them to be a commenter at a conference that more or less requires a famous commenter to get on the program. Someone asks you to write a report, or run a search, if you are fortunate enough to have a fulltime job, or be on a committee. This is the "just say no" phase that so many bloggers have written about. You say yes to a lot, maybe almost everything, because you realize this means they like your work, your work ethic, or maybe "they really like you!" 3. In the third stage, the one Notorious is talking about, you realize that you can't do everything. 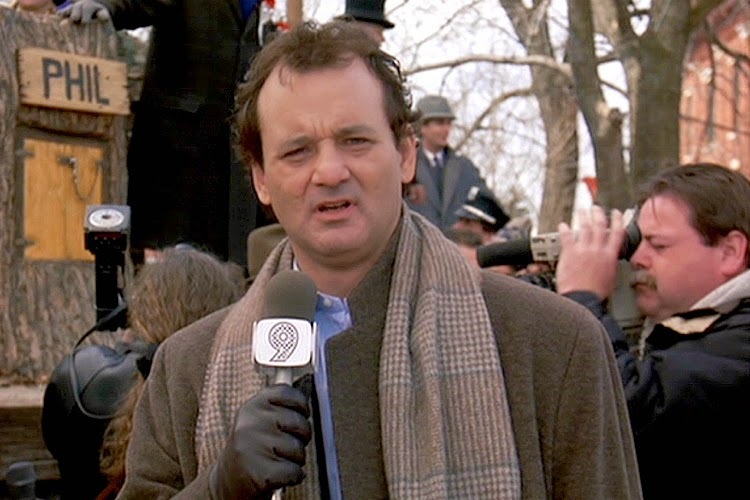 The time after tenure may feel at first as if you're in the movie Groundhog Day. Now, you're not a jerk like Phil Connors, so you don't have his lessons to learn. But you're doing the same things you did before, except that you can't see the next goal ahead. Every path you take--and they can be all good choices--means that there's a path you can't take. It's not infinite any more, and it's not directed toward a single goal (tenure). You have to choose the goal, and, in choosing, decide that some paths are ones you're not going to follow, maybe forever. Do you go into administration? That can be a new challenge, but it may mean you have to spend less time on scholarship. Do you focus on scholarship? If you do that and turn down opportunities in administration, you might not be asked again. Do you like where you are or decide to leave? Do you apply for new jobs? I mention this because Notorious does, but it's a drastic step. Maybe you decide on more work-life balance and take a few steps back from the job, either emotionally or actually, by resigning from some commitments and scaling back on others. You decide you don't need to go to as many conferences and that you will put that money toward your and your family's well-being. Are you prepared for, and can you accept, how that might affect your job in practical ways? For example, what if your department see you as less committed to it and to scholarly pursuits, which may be reflected in your performance reviews? I think that part of the post-tenure slump, or post-tenure more generally, might be in this third stage of choices. You now know how much time things take--to write an article, mentor a student, teach a brand-new class--and so you know that you have to choose, in a way that you didn't know in stage 2. In Groundhog Day terms, you can try to save the homeless man or rob the bank, but probably not both. You wonder if your choices are good ones, and you know you have to make the most of them. Part of coming out of the slump may be the growing conviction that yes, this is a good choice for me, and yes, this is a good path to follow. Eventually you get there, and you hope that it's February 3. Notorious Ph.D. has some good posts up, the first of a series, on post-tenure blues. And I can't help it, because the song's in my head: she called one post "I can't complain but sometimes I still do," so would you say this, or "life's been good to me so far"? Were you depressed post-tenure? Angry? Did you contemplate a career change? Did you check out for a while? Did you double down on the work? Feel free to post anonymously if you want. Not depressed or angry but liberated. I had done what the system said I should do, and, instead of going horribly wrong, as usual, it had worked. The job security thing was and is huge for me, irrationally so. I had not worried much about earning tenure, partly because I was working so hard but primarily because of an ingrained fatalism about my ability to affect the results. It was a huge relief to know that the institution would have to mobilize in major ways to fire me, if it ever wanted to. Maybe that's the mindset you get after years of adjuncting. But I know the feeling Notorious is talking about. It's like that Peggy Lee song "Is that All There Is?" that is on my "Top 10 Most Depressing Songs of All Time" list; Earnest English even expressed it that way in her comment over at Notorious's place. It's a serious issue, and a serious conversation. So--post-tenure blues, or were you more conflicted/relieved/other about it? At the Chronicle, somebody's determined to confuse/conflate "innovative teaching methods" with "stuff we can charge students for." Using standardized assessment tools to gauge student performance. The study is from the Bill & Melinda Gates Foundation, but I'm guessing some of the many profitable edtech/content providers are very interested in this, too. Just to be clear: Some of these don't cost money, of course, and I have no problem with any of them if the instructor finds them useful. But to take these as evidence of "innovation," and by implication to cast those who don't use them as not using "best practices," is illogical and rhetorically fairly--no, really--shady. This week in calling out sexism: "Office Housework" and "Bossy or Brilliant?" Two articles this week confirm what many of us have experienced about gendered attitudes. For staying late and helping, a man was rated 14 percent more favorably than a woman. When both declined, a woman was rated 12 percent lower than a man. Over and over, after giving identical help, a man was significantly more likely to be recommended for promotions, important projects, raises and bonuses. A woman had to help just to get the same rating as a man who didn’t help. And, for a little humor, "Reasons you were not promoted that were totally unrelated to gender" at McSweeney's. Some of the comments on the first article say, in effect, "yeah, the sky is blue, sexism happens, so why are you reporting on it?" But it's essential to report on this, and to keep reporting on it, because who would have thought, in 2015, we would still be having to talk about this because it was still happening? This isn't a new finding; these behaviors and their consequences have reported on since at least the 1970s. I experienced an example of the related phenomenon the other day, the one where a woman says something, is ignored, and hears a man make the same point to great acclaim 5 minutes later. In this case, I was in a meeting, summed up an essential intellectual/conceptual problem fairly elegantly (we all have our moments) and saw the rest of those in the room, all men, nod but otherwise not respond. Five minutes later, one of the men says the exact same thing, another man says "brilliantly put," and the rest chime in with words of praise. What's up with that? Why does that still happen? They obviously heard me, or why else would they have used my phrasing? Let me take that back: they heard the phrase and the logic, but they didn't hear me. Why didn't I bang my shoe on the desk and demand to be heard? Partly because I was amused to see this happen again, because this isn't my first rodeo with this kind of thing, and partly because of the double standard: nothing would be gained, and I would be spending social capital to push the needle of judgment on me toward "crazy and hysterical" instead of "sane and rational." It's not worth it. There are a few things we can do, though. Stop apologizing. I realized a couple of years ago that I was routinely using the phrase "I'm sorry" when reporting less than optimal news as part of my job and in a lot of other instances. The turning point came when I realized I'd used "sorry" about 4 times in a single message. I took them all out and have been writing stronger messages ever since. Sit on your hands once in a while when volunteers are needed. Not all the time, of course, but you don't need to save the world or even your department. Stop explaining. Learn the phrase "No, I won't be there at that time"; you don't need to explain why. They didn't ask you to explain; they asked whether you could be there. Offer another time or two when you'll be available. That's all they really want to know. You are not someone's research assistant (except when they are paying you). When someone says "I wonder if we could collate this information/run this data/match this information with that set/track down these addresses/update this database," say, "I'll put you in touch with someone who can do this" or, better still, "I'll look forward to your results." Answer the question that you're asked, not the premium version that you think they need to know. You are not in school any more, and there is no extra credit for email. If they ask you about A, and you reply with information about A, B, C, and D, they won't necessarily care or thank you, and you will have used up your store of time and willpower (h/t nicoleandmaggie) for something that is of no benefit to you. If they want to know about B, C, and D, they will ask. Do dog friends ever pick you up on your walks/runs? Today a nice golden retriever that I'd never seen before followed me for a good 2 1/2 miles through the neighborhood, all the way home. He would stop and look back to see if I was following him. When I got home and went inside, he said "Woof!" which apparently meant that this walk was not over as far as he was concerned. He's not there now, so I'm guessing he went home; he was obviously someone's dog and well cared for. I don't have a dog, but I'm guessing he wanted a walk and figured he might as well follow someone. I've had this happen more than once, not always with the same dog. Is this a dog thing that you've noticed? Now that the book is off my desk, I'm finding all kinds of conference papers and longer talks that I never turned into articles, reading them, and wondering why I didn't send them out. This is taking me away from the overdue article that I'm supposed to be writing but may pay off in the long run. Daniel Goldstein at IHE makes good points about the limitations of e-books. How likely is it that I will need this book in the future, and is it likely that a library will still have it? Or will the librarians have deaccessioned it for being old, or dusty, or because they see it as ridiculously obsolete (like those librarians that nicoleandmaggie link to who make fun of books)? Or because they believe in the whole 'Google Books now, Google Books forever' thing, when more books keep getting embargoed all the time? Some books that I'd otherwise have given away are ones I've kept simply because I'm not convinced I will never need them. Yes, I know: this ought to give me my own Discovery Channel series called "Hoarders: Book Ladies," but you never know.